Everyone reports having a wonderful time! See You All Next Year: February 22, 2020! From NH and Boston: I-93 North, I-89 North through New Hampshire and Vermont to Vermont Exit 14. From WMa and CT: I-91 North, I-89 North to Exit 14. From NY: New York State Thruway or Taconic Parkway to Albany. Adirondack Northway (I-87) to Exit 20 - Fort Ann. Route 149 12 miles to Route 4. Route 4 north 18 miles to Vermont Route 22A. Route 22A north 43 miles to Route 7. Route 7 22 miles north to I-189. I-189 to I-89 to Exit 14. From Montreal: Autoroute 15 to border, I-87 Exit 42 to Rt 11 to Rouses Point Bridge to Vermont. Route 2 South to Route 78 East to Swanton. I-89 South to Exit 14. Alternate route: Autoroute 10, Autoroute 35 to Route 133 South to Border. Then I-89 to Exit 14. Crown Point Bridge is VT Route 17 connecting Addison, VT to Crown Point, NY. Rouses Point Bridge is US Route 11 connecting Alburgh, VT to Rouses Point, NY. The ferry crossings schedules are subject to adverse ice conditions. Always check their web sites prior to crossing. The Ticonderoga, NY to Bridport, VT Ferry is	CLOSED for the season! From Rouses Point area: Northway I-87 Exit 42, Route 11 to Rouses Point. Look for signs for U.S. Route 2 and Rouses Point Bridge to Vermont. Go 2 miles past Alburgh and go left on Vermont Route 78. Continue on Route 78 through Swanton and look for I-89 South. Continue on I-89 to Exit 14. From Plattsburgh area: Northway I-87 Exit 39, Rt 314 to Ferry. (Runs every 15 min, $10 each direction). On Vermont side, right on Rt 314 to end at Route 2, right on Route 2 South, 20 miles to I-89. Go south one exit to Exit 14. From Crown Point area: Northway I-87 Exit 28, New York Route 74. Go North on New York Route 9N. (DO NOT go into Ticonderoga or follow signs for Ticonderoga Ferry, as this is closed for the season). Continue on 9N for 11 miles and turn onto New York Route 17. This crosses the new brige into Vermont. Continue on Vermont Route 17 East to Vermont Route 22A. Go left and take Route 22A North. At Route 7, go left and continue North on Route 7. Take I-189 to I-89 North to Exit 14. We have free parking on site. Sometimes the parking area fills up due to other events going on. Come EARLY! That way you get a good parking spot AND you don't miss the morning activities. General admission is $9. Doors open for general admission at 8:00. Early admission is $15. Doors open for early admission at 6:00. There is no charge for tables. Tables are first come, first serve. Come early! No admission charged for those 12 years and younger. Canadian money accepted at par for Canadian residents with driver's or ham license. Advanced sales are closed at this time. Admission is available at the door. The Vendor Room will run from 8:00 until 2:00. There are scores of tables chock filled with goodies. The offerings range from new to boatanchors and we can never know what jewels will show up. Forums will run from 8:30 until 1:00. Details are in the Forums section. W1V Special Event Station. Work the world from Vermont! DMR Programming Table - Befuddled by your DMR Radio? Come here for help setting it up! Mini-forums - Check the Forums section for times. Relaxation Area - Pull up a chair, relax and take in the activities! This is the place to gather after the goodies have been bought or sold, after the forums and after lunch. Starting at the conclusion of the last forum (12:55), the closing will be a brief activity featuring entertainment, announcements, acknowledegements and the (ta-da) the announcement of door prize winners. The closing ceremonies will take place in Forum Room 2-3. Make sure you set aside time for this event! Our grand prize is an Elecraft KX2 portable 80-10 meter transceiver! Other door prizes include books and gift certficates from the ARRL, antenna components, logging software, and a whole bunch of ham goodies. Please visit our HAM-CON Sponsor Page for a display of our sponsors for 2019. Be sure to tell them that we sent you! With 15-20 items and typically 100 people attending the closing, you have a very good chance to win something. But, you must be present to witness our outlandish closing ceremonies and to win stuff! If you leave early, you don't get da goodies! Door prizes will be drawn at the Closing Ceremonies at 12:55 in Forum Room 2-3. We will be able to check your QSL cards for DXCC, WAS and VUCC right on site! Please contact the people below and arrange a time and location at the Convention. Note: you MUST have the proper paperwork filled out and ready to be submitted to the ARRL. You must also have the appropriate form of payment ready to be sent. We cannot check cards unless the paperwork is in order! For DXCC or VUCC contact Mitch W1SJ . The Volunteer Exam Session will be at 1:20 in Forum Room 1. All exams (Element 2, 3 and 4) will be offered. All VE applicants must bring TWO forms of ID, copy of license and CSCE, if needed, pen, pencil. There is no charge for amateur radio exams. Exams for FCC Commercial Licenses (GROL, MROP, etc) will be at 1:20 in Forum Room 1. Please bring ID, proof of citizenship, FRN Number, pen, pencil and $50 exam fee. Contact examiner at (802) 879-6589 for details. RANV FLEA MARKET TABLE Located INSIDE the VENDOR Area. Bring your stuff for sale and we will try to sell it for you. Service for RANV Members Only! No boat anchors, computers, printers, monitors, etc. Unsold items MUST go home with owner! Visit HAM-CON's special event station W1V as we make contacts all over the world! We are always looking for operators - no matter what your license class! Stop by! Test equipment to provide basic measurments along with free technical advice. Just as you enter the facility, just after admission, turn right and you will head down the Forums Hallway. In this hallway you will find Forum Rooms 1 & 2 and the Activities Room, along with the RANV Table. Continue walking into the facility and go right at the Hotel Main Desk, then left. Here you will find the entrance to the Vendor Area. Facility layout showing location of Vendor Area, Forums and Exams. Vendor Area layout showing location of all tables. 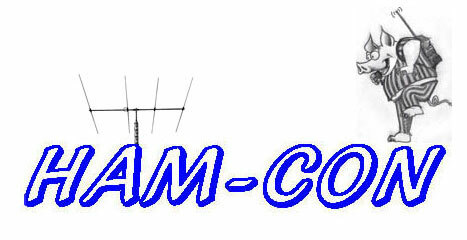 HAM-CON will have the finest collection of Amateur Radio Informational Forums found at any small convention! There is something which interests every amateur operator. Stop in on a forum or two and learn a whole bunch of new stuff. The forum times are tight, so plan your schedule in advance for best results! No PA announcement will be made at the start of forums, so use your phone or watch alarm to alert you to get to forum room on time. The forums will run in two different rooms. Forums will run from 8:30 AM until 1:00 PM. The Forum Room lobby is just to the right of the main entrance. Forums in Room 1 will generally start around the top of the hour and Forums in Room 2 will start on the half hour. Forums will conclude in time for attendees to attend the Closing Ceremonies. Make sure you get to the forums on time. They will not wait! A short talk followed by a long question period, on avoiding restrictive covenants, what to do if you made that mistake, and details on the ARRL's “parity bill” - proposed legislation to protect hams living under Homeowner Association authorities. We will learn how to present your case for a tower permit from the town, and how to understand Vermont's PRB-1 Law. Hosted by Fred Hopengarten, Esq, K1VR. Four new directors were elected to the ARRL Board of Directors this year, comprising one the biggest changes in the guard in many years. The Board just recently met in the bi-annual meeting to set out policy. How will the ARRL change with this new board? Our newly elected ARRL New England Director, assisted by our Vice Director will present details on the board meeting and the direction the ARRL will take moving into the future. This is your golden chance to ask a lot of questions! Presented by ARRL New England Director Fred Hopengarten K1VR. See what equipment, power sources and antennas are used in a compact travel station. The discussion will focus on the Elecraft KX3 portable transceiver, battery pack and antennas. This will be a show & tell with hands-on with many handouts available. Presented by John Grow VE2EQL. This forum will show and discuss all the aspects of getting started with the Raspberry PI 3B (their latest board) for experimentation and ham radio use. We will look at what is required to get started, on-line guides, projects and learning for getting kids involved. This will be a hands-on demonstration with many handouts Presented by John Grow VE2EQL. Testing for amateur and commercial FCC licenses. Amateur exam is free, commercial exam is $50 cash only. Bring two forms of identification, any CSCE’s, pens and pencils. Don’t forget to study! Paul is the new Electromagnetic Compatibility Engineer at the ARRL. He will present a look at modern, and some not so modern forms of radio interference, how to deal with it and what the future may hold. Presented by ARRL EMC Engineer Paul Cianciolo W1VLF. THE DIGITAL WORLD OF FT8 & DMR: FRIEND OR FOE? This forum will offer a survey of the two digital modes sweeping amateur radio by storm: FT8 (mostly HF) and DMR (VHF/UHF). The talk will present a brief introduction and how to get set up on these modes. Finally, the discussion will focus on the pros and cons of each mode and whether you want to be on them or not. Presented by Mitch Stern W1SJ. Dealing with antennas can be quite dangerous because they need to be above the ground and gravity would prefer to drop them to the ground. This talk is a detailed look at the OSHA rules regarding antenna and tower safety along with other hints on how to stay safe when working on your antenna. Presented by Bob Allen KB1FRW. WE FIXED YOUR TRANSMIT AUDIO - WHAT ABOUT RECEIVE? Our special guest is audio engineer Bob Heil who will join us electronically from the Heil Sound Assembly Plant in Illinois. Previous talks by Bob focused on transmit audio equalization - the science of adjusting the frequency response for better copy. But there's more! By exploring the science of audio we can do things to make it easier to hear those weak signals. Join us and learn how to copy those weak ones! Presented by Bob Heil K9EID. We will all get together for a brief 20-minute gathering to meet and say goodbye until next year. We will have news, acknowledgements, giveaways and the door prize drawing. The grand prize this year is an Elecraft K2 portable transceiver! Afterwards feel free to stay around and chat with friends. These will be held in the ACTIVITES ROOM. The mini-forums only run 10-15 MINUTES, so be sure to arrive on time or you will miss the show! 9:30-9:45 Dr. Jeff Presents Jeff will present another thought inspiring technical demonstration. 11:45-11:55 Dr. Jeff Presents Jeff will present another thought inspiring technical demonstration. We require that vendors and flea market sellers arrive EARLY to set up tables. The room gets too crowded to start carrying in sales items after 8:00. If you are selling, please buy an early ticket and have your table set up by 8AM. 1. Early entry opens at 6:00 AM. 2. Admission: $15 at door, $12 in advance. We highly recommend buying the admission in advance! 3. Tables are FREE. They are available on a first come, first served - No guarantees made on space or table availability. We usually have tables available, but on occasion we do run out. 4. Tables are reserved in specific locations for large vendors (more than 4 tables). 5. Tables can be reserved at a package price of $25, which includes 1 early admission. This will guarantee your table until 8:30. There are no refunds for tables reserved and not used! Get a sneak preview of the Vendor Area by downloading the Vendor Area MAP in Adobe PDF format. The location of all tables and services are approximate. Not all tables will be available. We ask that vendors take all unsold merchandise away at the end of the day. HAM-COM makes every effort to help our vendors do well at the show. Please let us know how we can help you! The Holiday Inn is our Headquarters for HAM-CON. They have reserved a block of rooms at a special convention rate of $95. Here are local phone numbers of other motels in the Burlington area. This list is information from the phone book. It does not imply any recommendation, although it's probably a safe bet that the roof doesn't leak at any of these lodgings. Harper's Restaurant, located on-site will be open until 11 AM only for breakfast items. There are many, many food locations nearby, within 1/2 mile! University Mall (largest in Vermont) is literally across the street! Bring the family and drop them at the Mall! Mall opens at 9:30. Burlington International Airport 1.5 miles East. Provides a quick way in and out of the Convention! Church Street Marketplace 1.5 miles West. Outside and Inside shopping in downtown Burlington. Echo Lake Aquarium 2 miles West, foot of College Street. Museum and Educational Center focusing on life around Lake Champlain. Open 10-5. The Milton Hamfest started in 1983 as the "Northern Vermont Electronics Show." It was conceived by WB1BWV, WB2JSJ and others as a way to get Vermont hams together for swapping equipment and socializing during the long winter. The admission back then was $2. The philosophy of the Milton Hamfest has always been to bring hams and experimenters together for learning new things and having fun. The hamfest has always been organized and run by a tiny group of volunteers, who, like everyone else, pay admission! The hamfest started with humble beginnings and an attendance around 150. Today, the hamfest draws around 300 people, which is a sizable number considering the small size of Vermont. Attendees come from Vermont, Northern New York, Quebec and New Hampshire. A few come from Southern New England as well. Over the years, some changes were made which we hope will keep the hamfest a great one. After many years of being an independent show, Milton is now sponsored by the Radio Amateurs of Northern Vermont (RANV), and is the ARRL Vermont State Convention. And in 2009, we moved it to a Convention facility. We have worked hard to bring in more Forum Speakers and live demonstrations. The Forum program at HAM-COM is the best you find at a small show. It is the goal of the HAM-CON to keep attendance levels stable and even show some growth even though hamfests all over the country have been declining in attendance over the last couple of years. We cannot do this without YOU! Please make every effort to join us! Keep checking back here for new information.